Two place seat, covered with white imitation leather, can be mounted on storage lockers and peaks. Foldable back support, can be used in drive or reverse position. Size: 80 x 40 cm. Two place anatomically designed seat with foldable backrest is made of white leather imitation, stripped with inner moltopren and marine plywood frame, fitted with stainless steel hinges (possible to order also separately). Width: 90 cm, Depth: 40 cm. 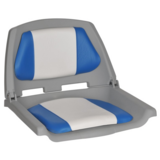 Swivelling seat made of white polyethylene, fitted with removable cushions (possible to order also separately); ideal for open boats, not altered by bad weather, very compact model, comfortable, made-ready to fit any pedestal available on Osculati catalogue. 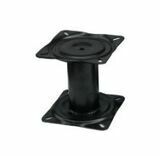 Fit with 8 brass threaded inserts for fixing pedestals and seats. Width: 52 cm, Depth: 42 cm, Height: 47 cm. Swivelling seat made of white polyethylene, ideal for open boats, not altered by bad weather, very compact model, comfortable, made-ready to fit any pedestal available on Osculati catalogue. Fit with 8 brass threaded inserts for fixing pedestals and seats. Width: 52 cm, Depth: 42 cm, Height: 47 cm. Removable cushions possible to order separately ! Swivelling seat made fo white polyethylene. Made ready to fit any pedestal available on Osculati catalogue. Seat dimensions: Width: 44,5 cm, Depth: 43 cm, Height: 40 cm. Made of white polyethylene. Supplied with extra stuffed cushions. Adaptable to all pedestals available on Osculati catalogue. Seat dimensions: Width: 49 cm, Depth: 40 cm, Height: 49 cm. Made of white polyethylene. Adaptable to all pedestals available on Osculati catalogue. Seat dimensions: Width: 49 cm, Depth: 40 cm, Height: 49 cm. Removable cushions possible to order separately ! Seat with foldable back. Vinyl cushion, stainless steel hinges. White. dimensions: 400 x 467 x 474 mm. Seat with foldable back. Vinyl cushion, stainless steel hinges. Navy blue. Dimensions: 400 x 467 x 474 mm. 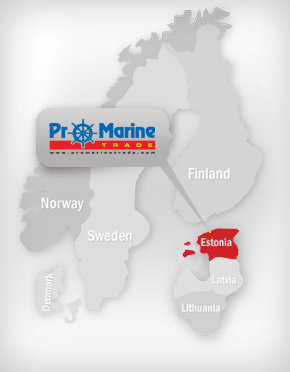 Made with highly resistant, marine-grade polymer. 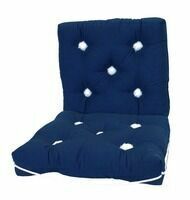 Comfortable thick moulded foam cushions. UV resistant fabric by OMNOVA. Large aluminium powder coated hinges. 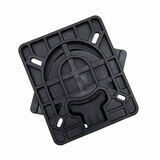 Heavy duty moulded plastic inner frame. Foldable low-back. Dimensions: Height - 406 mm, Widht - 534 mm, Depth - 506 mm. 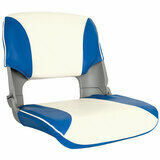 This Deluxe model stylish high back folding seat is made from high-impact, UV-treated polymer. Comfortable foam cushions. Foldable high-back with rear storage pocket on back rest. UV resistant. Dimensions: Height - 465 mm, Widht - 506 mm, Depth - 475 mm. 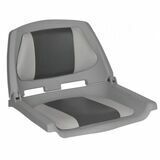 This is the only ergonomically designed folding boat seat in the market, designed to bring a new level of style and comfort. The generously cushioned wider seat and contoured back team together to provide truly comfortable seating. Ergonomically moulded seat frame. UV resistant fabric. Contoured dense foam core. Positive lock Fold down back. Dimensions: Height - 554 mm, Widht - 463 mm, Depth - 509 mm. Made from heavy-duty steel. Black EDC-coated steel protects against corrosion. Top and base are 175 mm square. Height: 330 mm. Made from heavy-duty steel. Black EDC-coated steel protects against corrosion. Top and base are 175 mm square. Adjustable. Hight: 305-457 mm. Base and pedestal made of mirror-polished anodized aluminium + anodized aluminium swivel slide. Fixed type. Height: 457 mm. 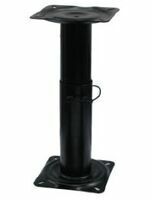 Pedestal diameter: 87 mm. Base diameter: 228 mm. Swivel seat support. Height: 45 cm, Tube diameter: 80 mm, Sanded base. Swivel seat support. Height: 30 cm, Tube diameter: 80 mm, Sanded base. Molded from tough, self-lubricating polymers. Quick connect 360° swivel and offers a truly removable seat option. Dimensions: 175 x 175 mm. Made of anodized aluminium, easy to use, light weight, rust-proof, easy to install and very sturdy. Dimensions: A= 25/50 mm, B= 402 mm, C= 87 mm. Max.Load: P1= 120 kg, P2= 60 kg.